Your resource for all things shoegaze and dream pop: WTSH Exclusive VIDEO PREMIERE: No Honeymoon | We're Doing Fine. 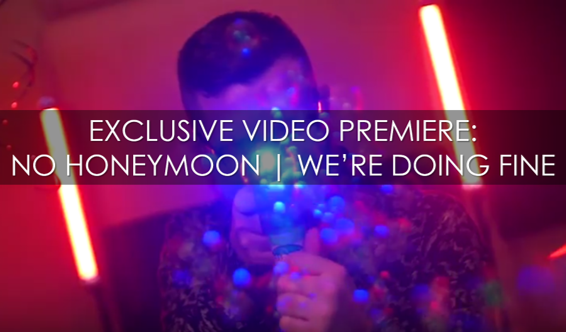 WTSH Exclusive VIDEO PREMIERE: No Honeymoon | We're Doing Fine. No Honeymoon is a dream pop quartet out of Brooklyn, NY comprised of Cait Smith (guitar/vocals), Rob Scheuerman (guitar), Nate Patterson (bass) and Ryan Barnes (drums). The group has been crafting quality ‘gaze since 2015 with the release of their debut EP, I Wanna See Everything. On their most recent offering, last fall’s It’s Whatever EP, No Honeymoon sounds stronger than ever before. While previous releases fell more on the lo-fi, fuzzy side of the spectrum, the six new songs on It’s Whatever feature a cleaner sound and more pop-oriented song structures that suit Cait’s vocal presence perfectly. The sonic backdrop is still reverb-laden and shimmery, but the instruments are tightly meshed and skillfully entwined. The group is in peak form. WTSH is proud to premiere No Honeymoon’s new video for “We’re Doing Fine”, the first single from It’s Whatever. The track showcases the band’s signature vibrant sound and Cait’s emotive vocals. Her voice rings out clear and true over a fuzzy sonic backdrop that is both deliciously distorted and catchy as hell. The video was shot in Brooklyn by George Ivanoff. Cait told us, “We recruited a bunch of friends and plied them with alcohol to get them to be silly with us on camera. It was as fun to make as it looks!" Brimming with youthful exuberance and soundtracked by a killer tune, the video is a perfect snapshot of No Honeymoon’s charming talent.